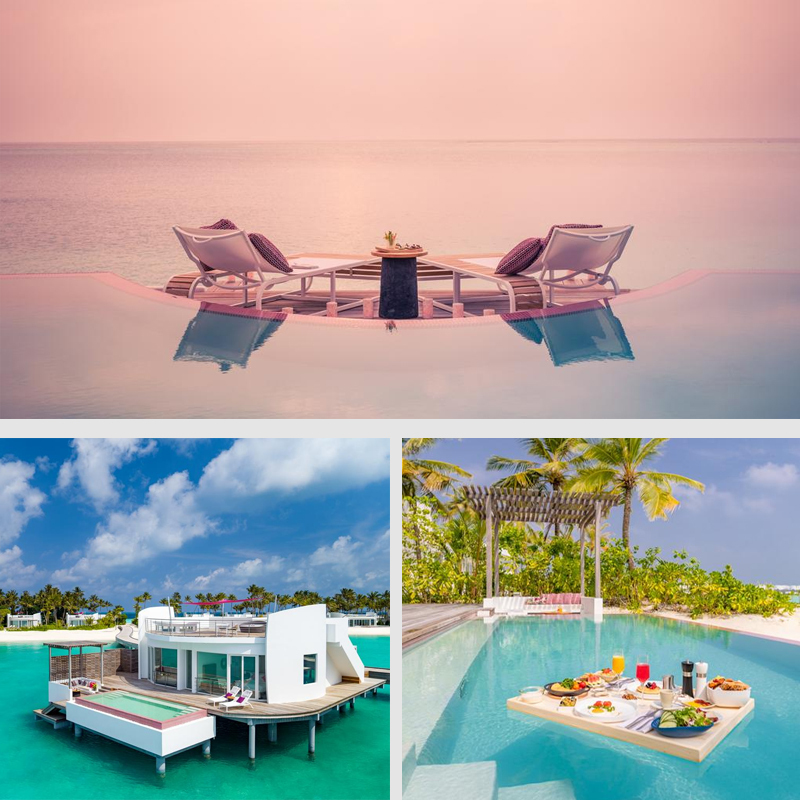 The Maldives is our number 1 top selling destination for honeymooners and we’re always on the search for new hotels to inspire your next honeymoon getaway. 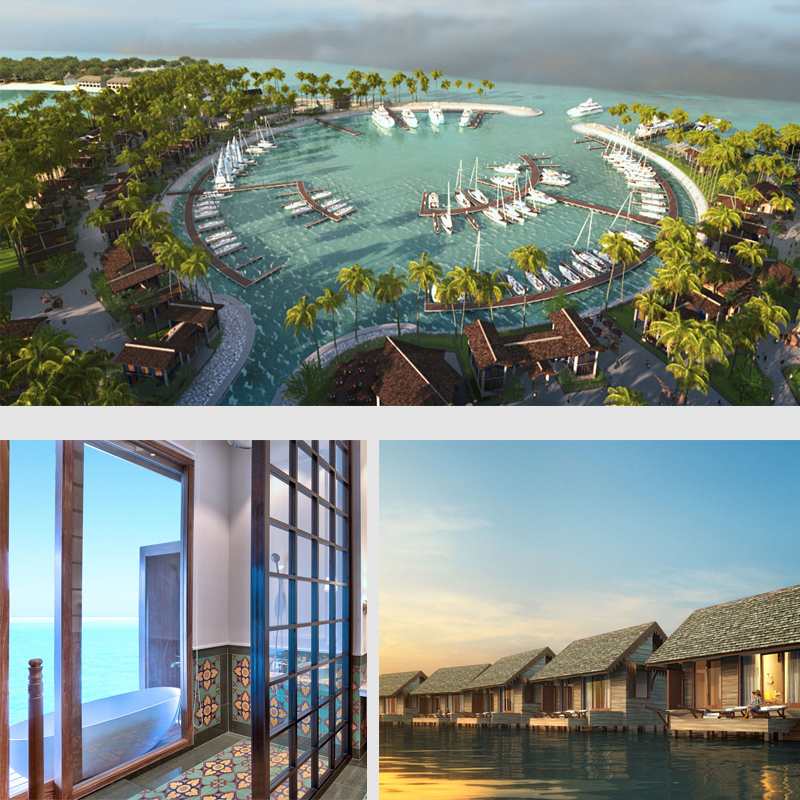 2019 is an exciting time to visit the Maldives with the opening of The Marina @ CROSSROADS – an exciting and new concept to the Maldives where guests can enjoy private island living combined with exciting shopping, dinning and entertainment nearby. 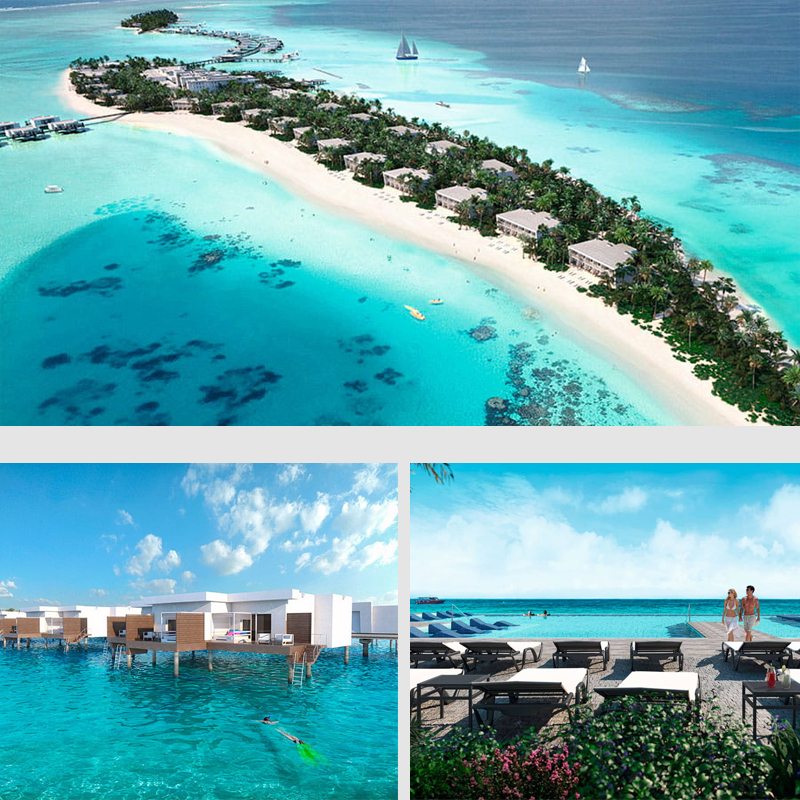 Scroll down to discover the brand new resorts Maldives resorts opening in 2019. 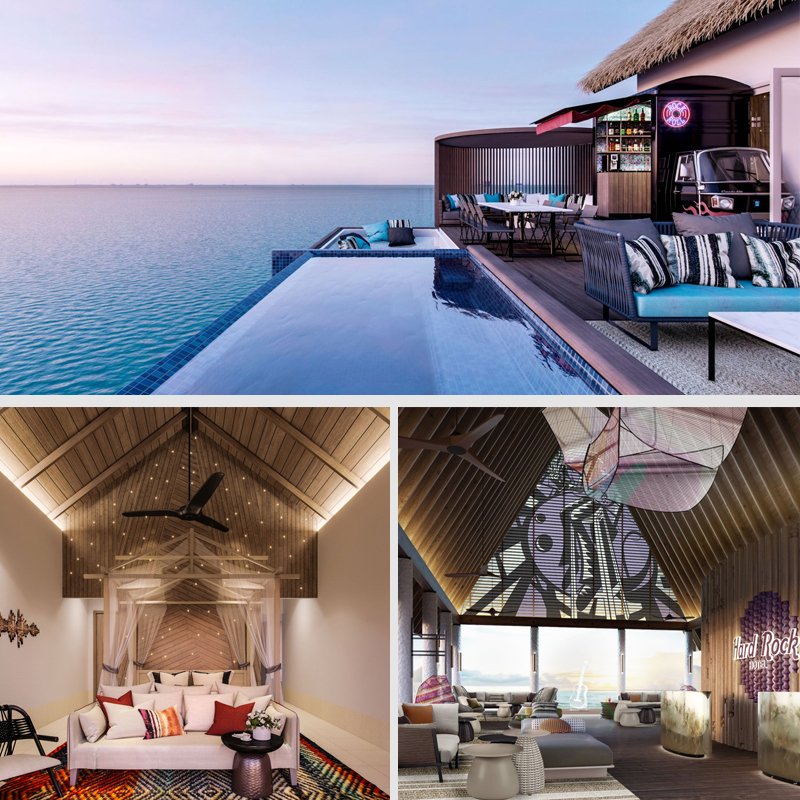 There are so many reasons to get excited about this brand new Centara resort in the Maldives; this 5 star resort will feature an underwater restaurant and a floating cinema. Located in the Baa Atoll, which is a UNESCO World Biosphere Reserve means that the rich marine life is not too far away for world-class diving and snorkeling. Italian flair is brought to the Maldives at the luxurious Baglioni Resort, celebrate newly married life in one of the Italian-styled villas on the beach or over the lagoon. The finest Italian dining options will get your tongues wagging, with 3 restaurants and exceptional experiences from wine tasting and personalised private dinners. Newlyweds can enjoy a mix of unforgettable experiences to create those magical honeymoon memories, such as cruising under the stars boat tours, dolphin boat tours and ocean sunset cruises. LUX* North Male Atoll brings luxury island living to an entirely new level in 2019 with uber luxurious penthouse villas offering guests two-level living on the beach or overwater thanks to the stunning sky lounge where incredible vistas of the Maldives can be appreciated in privacy of your top deck terrace. Offering a plethora of facilities for an unforgettable honeymoon, this resort features 2 swimming pools, overwater spa, world-renowned diving, high adrenaline water sports and luxury yacht escapes. 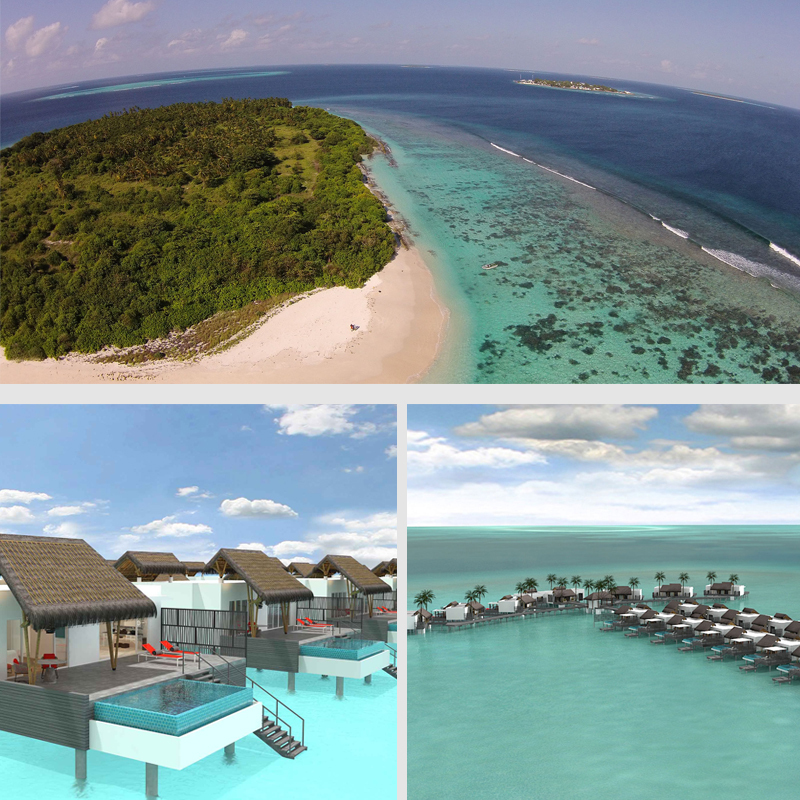 Spread across 3 islands, this brand new Maldives resort has everything a romantic time! Each ultra spacious villa boasts of an infinity pool, al fresco dining area with cosy lounge chairs, large bathrooms with double vanity, waterfall shower and stunning ocean vistas. There are 10 incredible dining options on the island and for something special on your honeymoon, book a table at Terra where you can dine from the treetops with the most amazing views of the ocean and horizon. Opening on the 1st of June 2019, this premium all inclusive 5 star resort is the ultimate choice for your romantic honeymoon, as a proud member of The Leading Hotels of the World and located on one of the best atolls in the Maldives with a beautiful 1.5km white sandy beach. The stunning spa features an Indonesian style pool, steam bath, sauna and 9 treatment rooms, newlyweds can enjoy Asian, South American and world cuisines at its 4 restaurants. The ultra modern Beach and Water Villas feature home comforts and the stunning bathrooms have an outdoor “under the stars” shower. 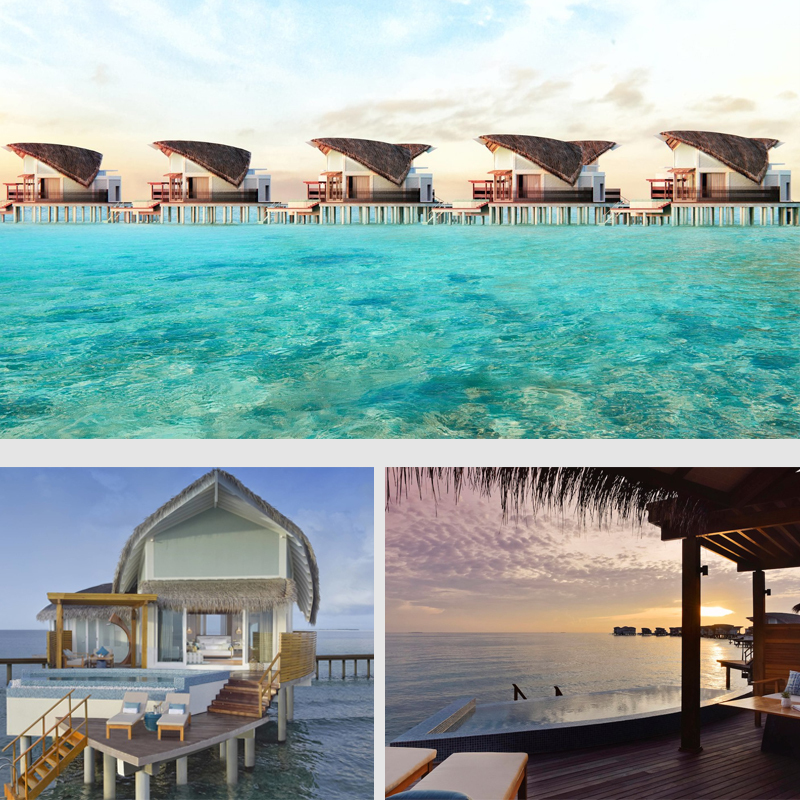 Offering access to The Marina @ CROSSROADS – an entertainment island with dining, shopping and much more, a honeymoon at Hard Rock Hotel Maldives is an excellent choice for couples that love plenty of things to do. The stunning studio and villas offer guests Hard Rock Hotel style blended with island charm with vibrant and modern interiors. The Rock Star Villa is impressive with a tuk tuk bar, infinity pool, private boat docking access and plenty of room to rock out with ample living space. Non-stop Maldives entertainment with live music and a full schedule of things to do at The Marina @ CROSSROADS offers endless opportunities for couples celebrating newly married life. Opening its doors on the 1st March, You & Me By Cocoon is a private and rustic island located just 20 minutes by speedboat from Ifuru domestic airport, this adults-only island offers honeymooners a romantic spot to begin married life. Around the island there are 6 restaurants and bars, daily entertainment with live music and DJs as well as a range of unforgettable excursions such as dolphin cruises, big game fishing and local island tours. An utterly romantic honeymoon awaits on the private island of Maafushi, which offers the best 24-hour all inclusive service. With over 250 rooms offering modern comforts, newlyweds will love the Superior Junior Suite located over the water allowing you to snorkel straight from your spacious, furnished terrace. 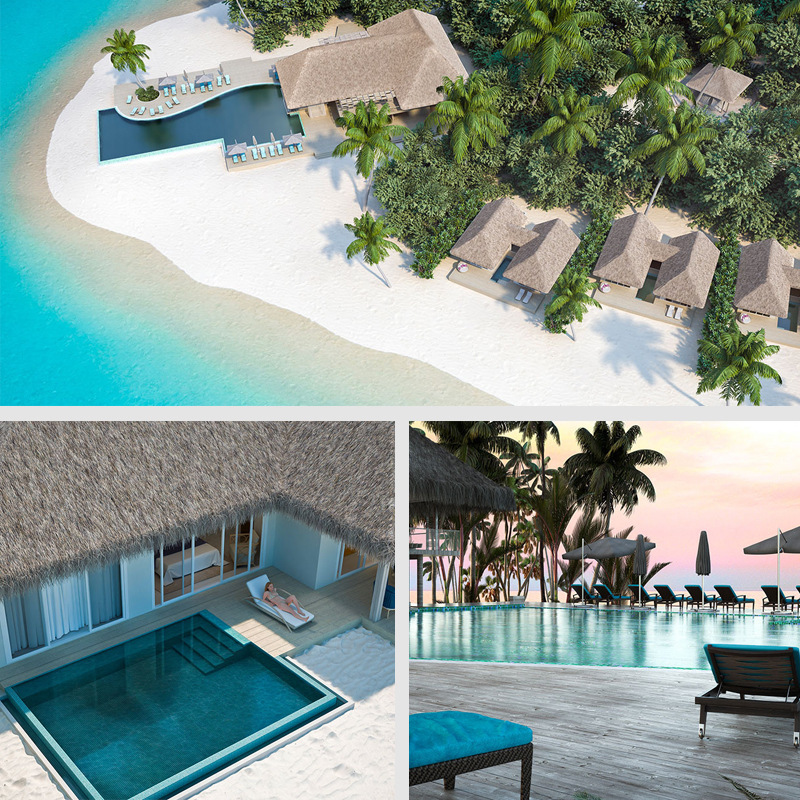 This beautiful Maldives island hotel opens May 2019. 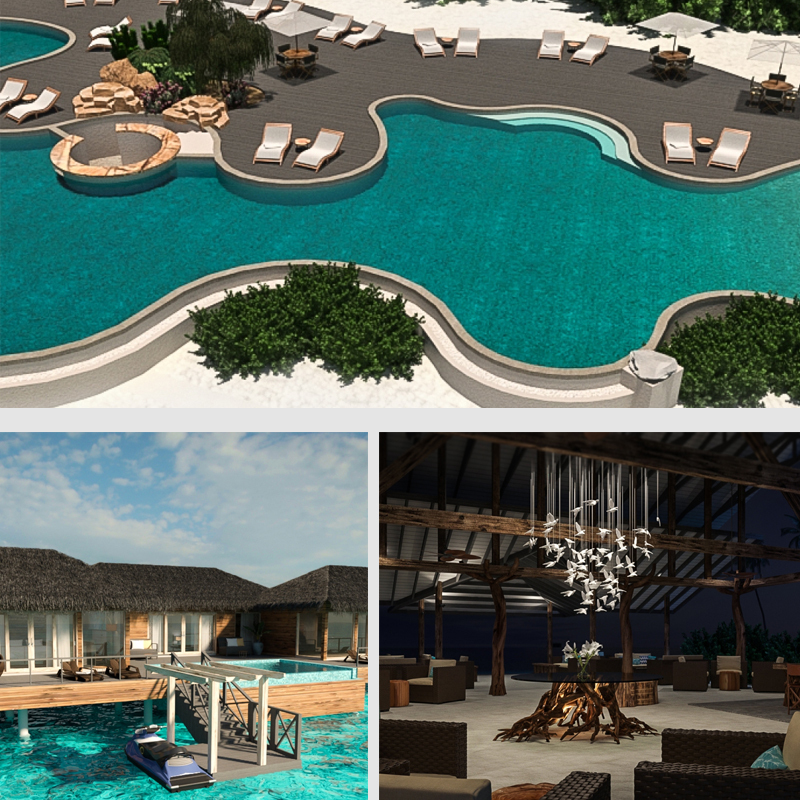 Opening July 2019, the JW Marriot Maldives Resort & Spa offers honeymooners a slice of heaven with just 61 beach and water villas, each having its very own private pool. The 6 restaurants transport guests around the world with the flavours of Thailand, Italy, Japan and International cuisines. The hotel’s facilities include a stunning spa, swimming pool, fitness center, water sports and land sports. Surrounded by crystal clear waters, which homes unspoilt house reefs, Raffles Maldives Meradhoo welcomes guests in 2019 to its remote location on the southern tip of the Maldives archipelago. 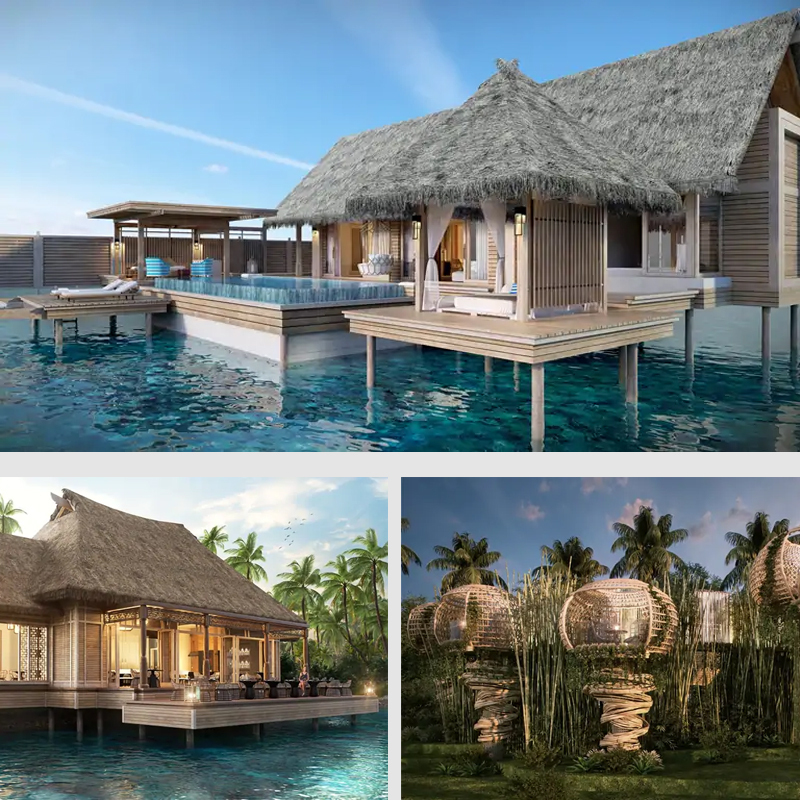 With just 21 island villas and 16 water villas with pools, the resort is pulling out all the stops with a private chef service and 24-hour butler service for guests looking for first-class luxury service. Resort facilities include an overwater spa, fitness centre and dining choices include a cocktail bar and 3 top class restaurants. Enjoy the feeling of being on a private island with the benefits of having access to The Marina @ CROSSROADS, which offers shopping, dining and entertainment. Ideally located near top attractions of the Maldives such as Emboodhoo Canyan, Reef Shark Point and Turtle and Dolphin Discovery Point, this tranquil Maldives resort is perfect for active honeymooners. Designed with boutique flair, guest rooms and suites offer a tropical base with gorgeous views of the lagoon or ocean. 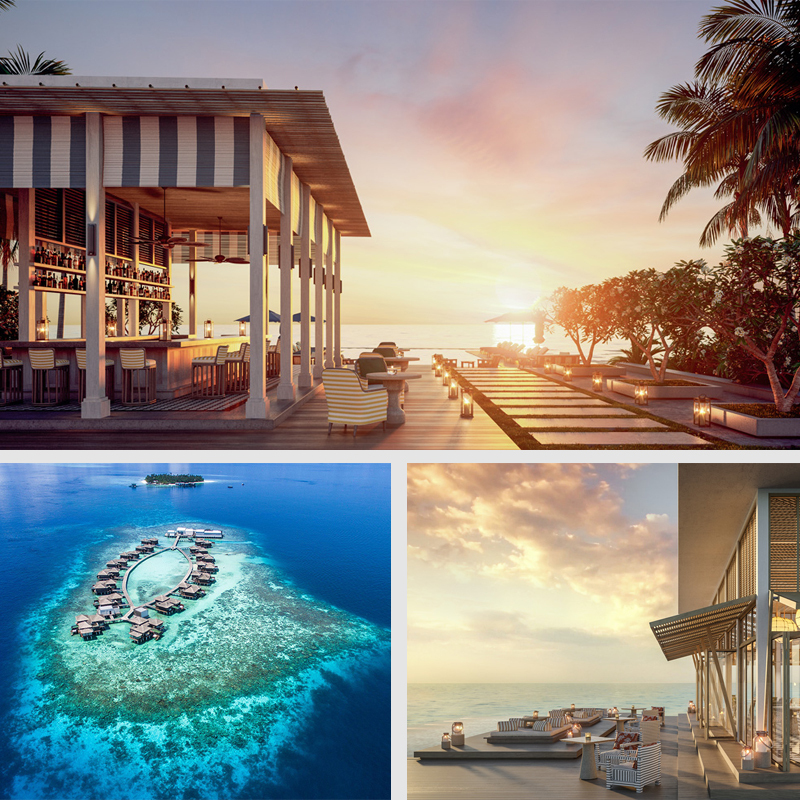 Inspired by these amazing Maldives resorts opening in 2019? Contact us today to discuss honeymoon packages to the Maldives call us on 0121 440 6268 request a quote online or book an appointment in our Honeymoon Suite in Birmingham.